Quotes, citations, expressions, I regularly use them. I love using proverbs, sayings and quotes in my everyday speech. Actually I’m just some kind of a language nerd. Beside that I also love coloring, with a diversity of materials. And exactly those two things, that fit me like a glove, have been been brought together in the book ‘Chalk-Style Expressions’, or ‘Chalk Letteren Quotes’ which is the title of the book for the Dutch market. Expressions to color, in beautiful, swirly letters. Valerie McKeehan is the artist responsible for these drawings and this book was published by BBNC Publishers in the Netherlands. BBNC has been so kind to send me a review copy, as well as a copy of Valerie’s other book, Botanicals. I thank them dearly, these books are really super nice and exactly what I like! My favorite quote, that I regularly use, is not in the book. It would have really surprised me if it were, by the way. And now you obviously want to know what that quote is, haha. Will tell you about it later along with a surprise! First a bit more about this book. Since it’s such a cutie! 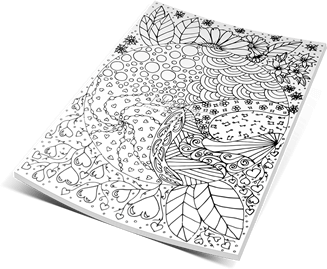 The cover looks so beautiful and attractive, it makes you want to start coloring right away. And then, take a look on the insde… Valerie shows how her drawings were made. These are real chalk drawings! No computer drawings, no pen nor pencil drawings that have to be altered on the computer afterwards. Nope, she makes a sketch and then she draws it with chalk on a blackboard. When she’s ready, and likes what she has drawn, she’ll take a picture and that will be imported into the computer for eventual necessary modifications. But basically these are just real chalk drawings. That is so cool! The book contains a lot of nice examples. Chalk-style expressions that have been colored already, or partly colored. Valerie explains the use of the power of white, leaving parts of a drawing blank. Sometimes not coloring parts of a drawing raises the effect. As colorists we’re often so apt to think every little thing in a drawing needs to get a color. But sometimes a design will become much more striking by not coloring certain parts. And that wasn’t that clear to me before. This book really made a difference in getting that. I must say that the designs that were colored by Valerie, as examples in the book, were colorized by computer and not with coloring materials like the average colorist uses. But who cares, since the examples are very nice and inspiring! The book also contains some information about color theory and tips and tricks how to best color in chalk-style drawings. Another advantage of the designs in this book is that they don’t take a lot of time to color. Sometimes you just don’t want to be working on a single design for days. Every now and then you just like to colorize a quickie. And this book is ideal for that! The three designs that I’ve colored so far, were all done on the same day. I’ve started with the first quote in the book. I liked that one best to start with, since Valerie’s colored example was printed right next to it. That way I had at least a bit of an idea what was possible and gave it my own twist with my choice of colors. I’ve worked with several different materials for this one. The arrows were colored in with Tombow Dual Brush pens and the letters were partly colored with white, silver and gold Posca markers. I’ve also used a Giotto Glitter felt-tip pen (at least that’s what I’ve written down haha, can’t remember what color(s) I’ve used or what exactly I’ve colored with it). And finally I gave the white letters a bit of a shine with a transparent Spectrum Noir Sparkle marker, because I happen to love glitters. The paper was very good by the way, with all the materials that I’ve used! When this design was finished I felt there was something missing. The black background doesn’t give a lot of possibilities to add something to it. At least that’s my feeling. But I did add a couple of stars around the quote and I like the kind of funny effect of it. (Pictures are in the photo album, link will follow later on). 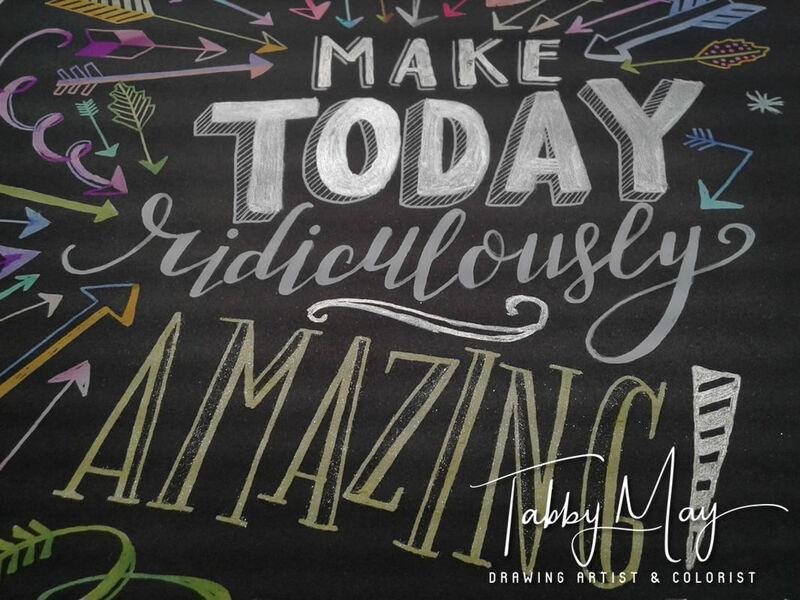 The quote ‘Make today ridiculously amazing’ very much appeals to me. Whatever a day may bring, in the end it’s how you cope with it that defines the day. And that’s totally up to you. That way an off-day can turn into a great day, by having a positive attitude and focusing on things going right or being okay. Ah well, maybe I’m just an overly positive person hahaha. I usually start my days quite happy. The moment I open my eyes I am wide awake. Unlike some other people I know, who first need ‘a break and relax’ (a break of what??? You’ve just been lying for at least 7 hours with your eyes closed!). I seldom have that experience. I wake up, open my eyes and jump out of bed. And from that moment on I’m ‘on’, often starting to sing and laugh instantly. Ready to do whatever. And therefore I’ve picked the next quote to color in: ‘Rise & Shine’. That’s right up my alley. It’s exactly what I do, every day again: I get up and I shine. This drawing also has a colored example in the book, so I used that to see if I could make my version look like it. I’ve worked with alcohol markers this time: Twin markers (from the Dutch discounter shop Action) and also a couple of Promarkers and Brushmarkers by Winsor & Newton. What I like a lot with alcohol markers is that they color so equal, without transitions when you happen to touch a previously colored area. And the colors are really standing out, especially with the black background. I copied the example and left a part of the design white. 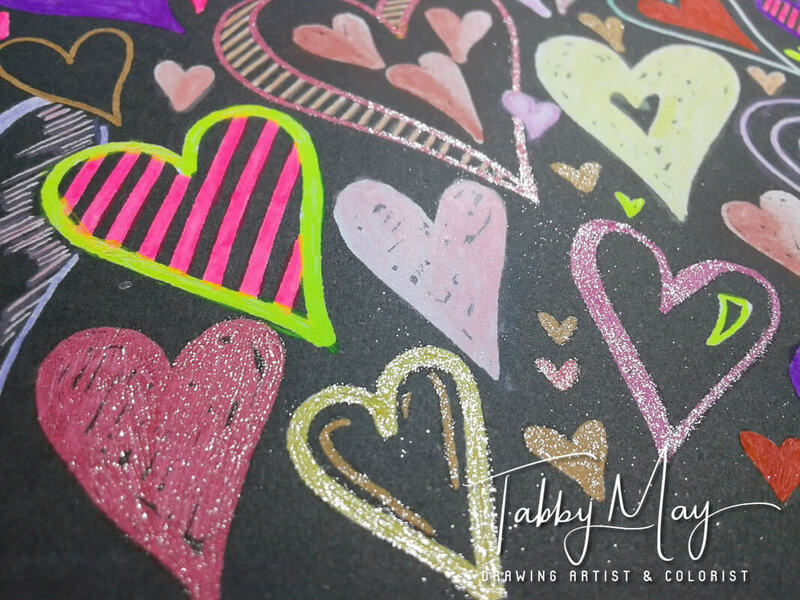 But I did use the transparent Spectrum Noir Sparkle marker on the white, to add some shimmer and glitter. I’ve also added some SN Sparkle glitter to a couple of leaves and stems. For once it wasn’t too bad to color by a precolored example, but I’d rather follow my own inspiration. So the next one was colored using my own insights and inspiration again. And gosh, did that one turn out merry! The quote is ‘You are so loved’. Back in the days I didn’t feel very loved at all, but nowadays I’m in the lucky position of having people around me who really care and sincerely love me. And I’ve learned, yes here she comes again with her wise lessons, that you need to love yourself first to be able to let others love you! And this quote is perfect for that purpose as well. Do you suffer from feeling inferior? Is loving yourself a struggle? Then color this quote, frame it and hang it near a mirror and look at yourself everyday while reading the quote out loud: “You are so loved”. And add to that “I am loved”, “I’m worthy of being loved” and “I love myself”. I bet you will start feeling more appreciation and love for yourself soon enough. Taking out the page from the book is easy, since all pages are perforated! In this drawing I’ve used a lot of bright colors, even neon colors that I seldom use. I’ve worked with Faber-Castell Pitt Pastel pencils, Holbein pencils and gel pens. And I like it so much, it has become so lively! Just looking at it makes me feel totally happy. One of my favorite quotes is “Life is like a box of chocolates. You never know what you’re gonna get”, from the movie Forrest Gump. But my most favorite quote is one that I’ve learned, about eight years ago, from T. Harv Eker from his book ‘Secrets of the millionaire mind‘. In this book he explains how our reality is created by our thoughts. More so, by our emotions (in the meantime this has recently been proven by scientists in three separate researches)! 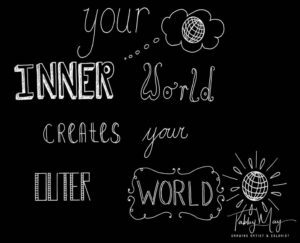 So here it is, my favorite quote of all times: “Your Inner World Creates Your Outer World“. 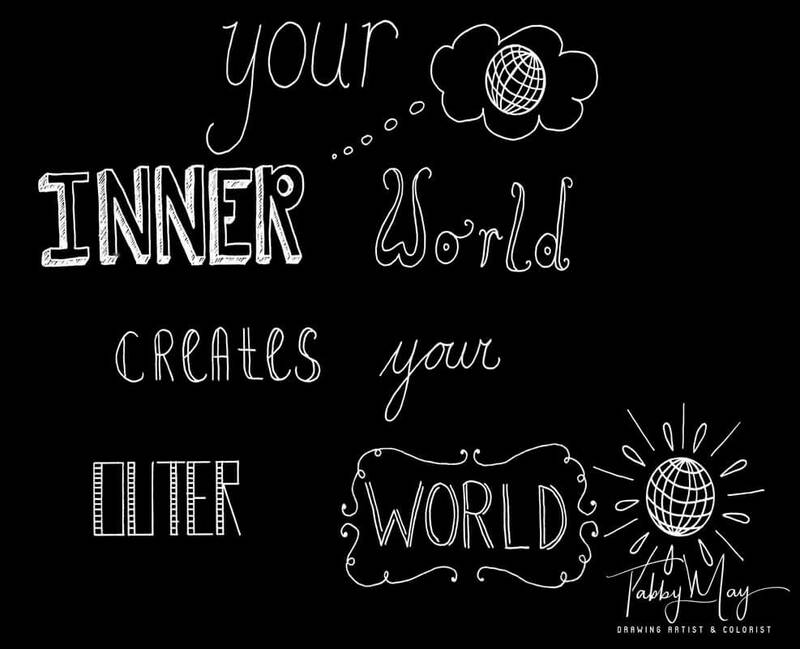 And especially for this blog post I’ve been working on a special hand lettering design with this quote. The result is on the right side (inverted, to make it look chalk-style hahaha. The original has black letters on a white surface 😉 ). Everyone that will send me an email with the subject ‘world‘, and your name in the body, will receive my hand lettered quote in return! Like it? 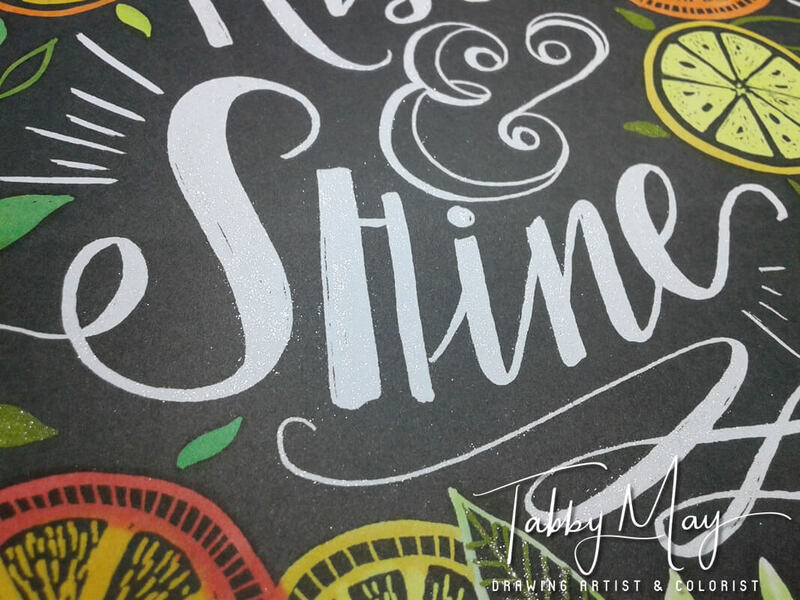 Then quickly mail to handlettering @ tabbymayart.com (without spaces, they’re just there to avoid spam!). 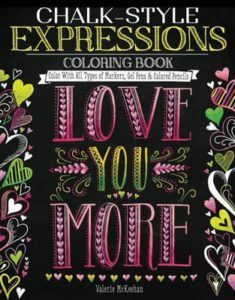 Have you been inspired by my colorized quotes in this fun coloring book Chalk-Style Expressions? You can order a copy yourself by clicking here or on the picture or link right below. 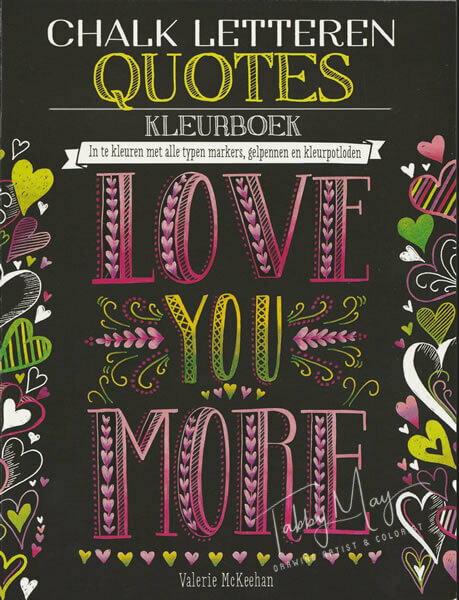 Of course you can also buy the Dutch ‘Chalk Letteren Quotes’ by clicking here. I’ve added quite some pictures, that didn’t make it into this blog, in a photo album. Among them there’s a colorized one of my hand lettering quote! Click here to watch the photo album or use the link in the top menu to see all albums. Please share this blog on Facebook and Twitter, so more people can get the first original Tabby May Art freebie! Thanks! Previous: Doodling for beginners. Can or can’t I do it? Next: Global Doodle Gems Review Team – What am I up to? Echt een GEWELDIG leuke vandaag! Al een paar keer met het boek in mijn handen gestaan. Ik hou van quotes! Maar heb al zoveel boeken. Toch maar halen denk ik. Hihihi en bedankt. Dat handletteren is prachtig mooi geworden. Wat een talent. Haha, sorry 😛 En dank voor het compliment. Vond het echt leuk om te doen, dus er zal wel meer volgen.